Original artwork of people smoking and children handing out cigarettes, which once hung inside England's last tobacco factory, are set to go to auction. About 120 "artefacts" are up for sale following the closure of Imperial Tobacco's Horizon factory in Nottingham, in March 2016. The building, known as Players, after founder John Player, had the pictures displayed across five floors. The rare paintings, which formed the basis of the company's advertising campaigns, have never been on public display, the auctioneer said. The Horizon building, which was built in 1972 at a cost of £14m, was one of the most modern factories of the time. 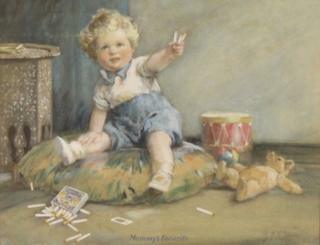 The oil and watercolour paintings depicting children playing with cigarettes and women gleefully smoking, were painted before awareness of smoking's health risks became more widespread in the 1950s. Robert Opie, director of the Museum of Brands, Packaging and Advertising, said: "Before the Second World War, most people were unaware of the dangers of smoking. "Indeed, the art of smoking had become glamorised by the great film stars of the 1920s and '30s, and a well-directed cigarette holder could help underline many a dramatic statement. "In this era of innocence, whether it was the appeal of women (who were still to take up smoking in large numbers), sportsmen, or even children, they were all used to advertise cigarette brands in just the same way that custard, biscuits or toffee would have been promoted." Trevor Palethorpe, from John Pye Auctions, said the "rare paintings" had only been seen by a small number of people and had never been on public display. He added that the collection included an "eclectic range of pieces that have a strong history attached to them". Imperial Tobacco, which had factory blocks in the Radford area of Nottingham, made more than one million cigarettes a day and employed up to 7,000 people at its height in the 1930s. It was one of the biggest employers in the city for decades before the Horizon factory closure when about 500 people lost their jobs. A spokeswoman for John Pye Auctions said there was no figure on the total value or estimated value of the lots. The public can view the items at the auctioneers' Marchington site, in Staffordshire, on Monday, and Trent Bridge Cricket Ground on 6 June, before the online auction ends on 7 June.